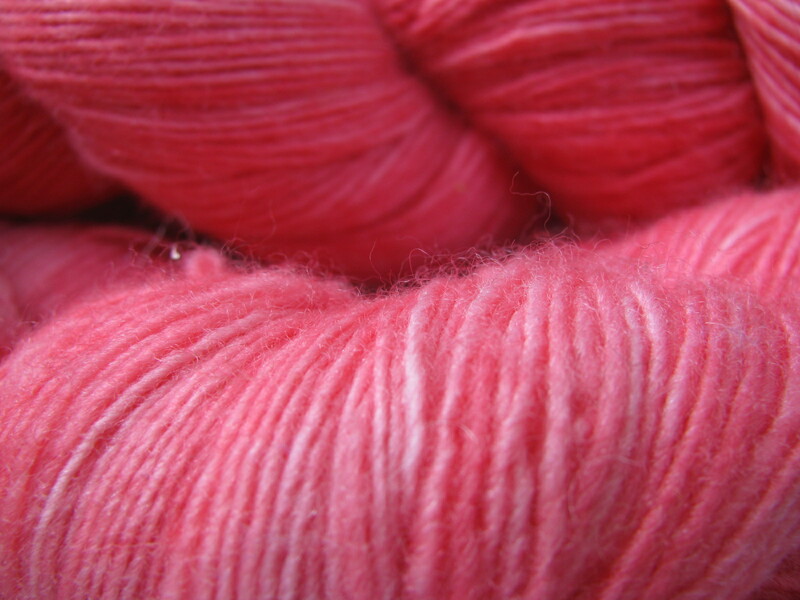 … she succumbed to the siren call of Romni Wools. EVIL KRISTINA: How do you know??? I knit faster than you do, you lazy wench. You’re too busy being goody-goody and doing things like working and being sociable. GOOD KRISTINA: You can’t finish two full lace stoles by the end of July! That would be impossible. EVIL KRISTINA: Besides, whose fault is it the needles are gone anyway?!? I wanted you to hold onto all that Dale Svale lightweight stuff but no… you had to clean out the stash room and take the whole bag of it to the Goodwill box. And that’s why the needles are gone – they were in that bag, you twit!!! GOOD KRISTINA: But there’s no more room in the storage locker!!! GOOD KRISTINA: (holding head) I … I … oh, never mind. … and besides, the evil people at Romni have moved the Malabrigo to the front of the store, instead of hiding it in the back where I actually had to go and look for it. Malabrigo? you might well ask. Didn’t I say just last week I already had 4 kilometres of the stuff in my stash?!?! Shocking pink! And, in yesterday’s ultra hot weather, it reminded me of a refreshing watermelon ice. So, how could I resist, really? GOOD KRISTINA: Hey – have you forgotten it’s JJ’s birthday?!? We should be buying stuff for him, not for us!! Today of all days! GOOD KRISTINA: I mean, at least I bought him that fancy $90 bottle of malt whisky from Cape Breton – and you never even chipped in. So, what did you get him? Huh??? Huh??? EVIL KRISTINA: OK – NOTHING. All right? Satisfied???? Well, I probably should have resisted, actually. Why? Because, on the way home from work yesterday, I was all of a sudden plagued by a recent memory – something that I had not only actually come across in the stash just last week but documented in that dreadful “I’ll never ever ever – and I mean NEVER – go to the LYS again!” post. I hoped that perhaps my memory was failing me (as it seemed to have while in Romni earlier – but then I can hardly be blamed for that, can I?!?). One thing very clear in my failing memory, however… the image of me tossing the Romni receipt blithely away into the bin at St Andrew station on the way to the train. After all, I wouldn’t need it, right?! GOOD KRISTINA: heh heh heh heh heh. Serves you right. EVIL KRISTINA: Ah, shuddup already. What are you talking about? 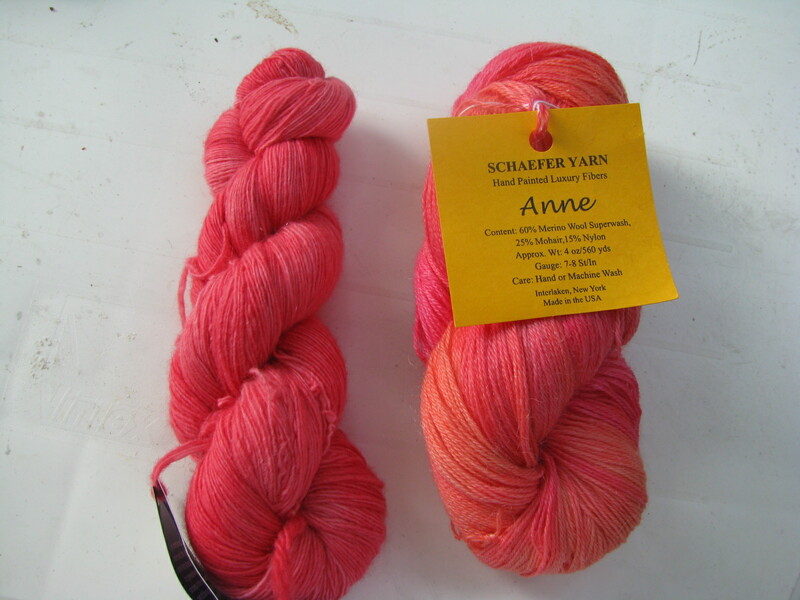 Don’t you see the subtle differences in the Anne and the Malabrigo? First off there is the whole weight thing. Why you could even try to make socks with the Anne! And the Anne has bits of orange in it. 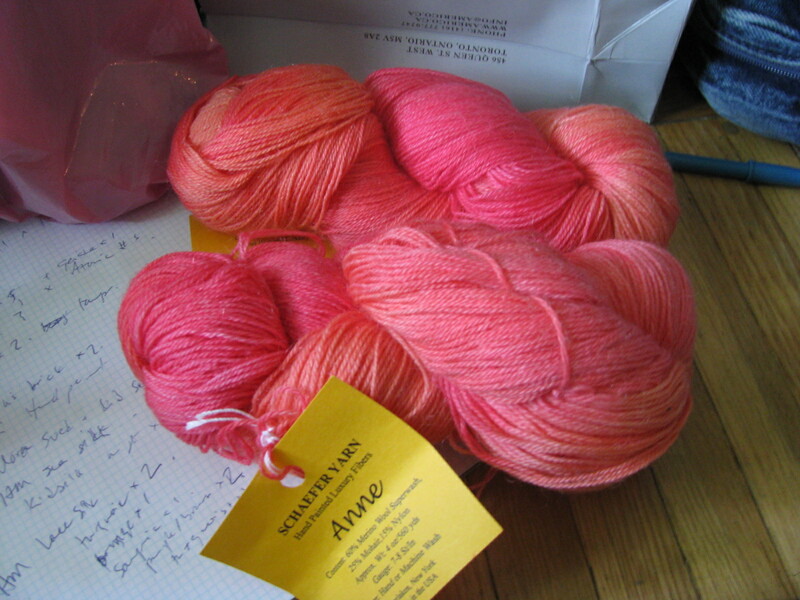 And Malabrigo isn’t so expensive (at least not here) that purchase is completely justifiable! There are certainly differences in fiber content as well. 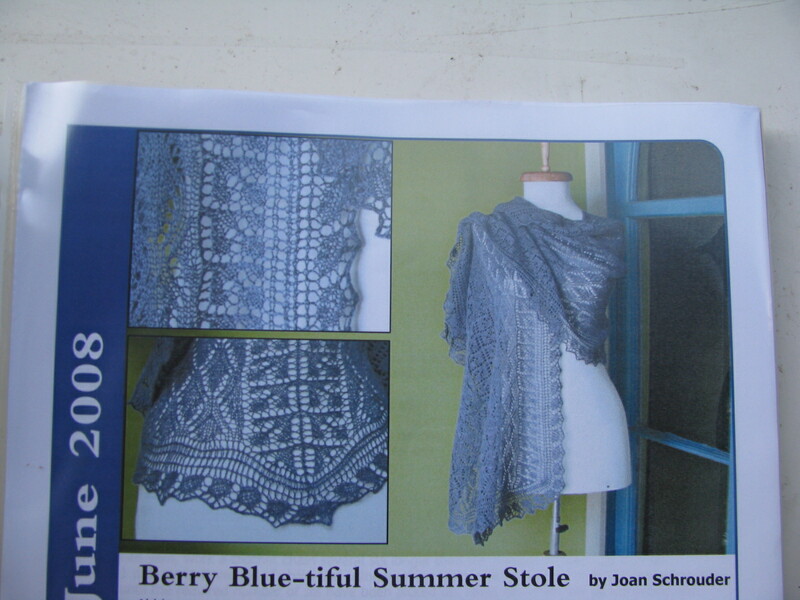 And you can knit something for JJ from some of it, like a shawl to keep his woman soft and warm. Malabrigo doesn’t count. You can buy all of the Malabrigo you want…it does.not.count. And I think your co-worker has an inner knitter that she maybe denying. Ohmygosh! 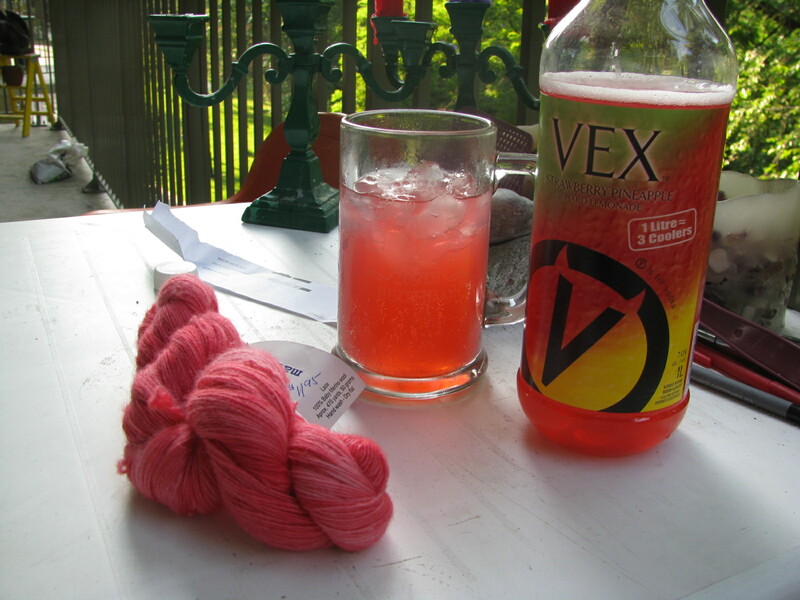 I just went through a knitter’s stashguilt Freudian/puritanical angst thingie on my little bloggie today! But you make me look good! thanks, pal! And happy belated Canada Day! Joan in MD (who still keeps a copy of O Canada! in her Franklin Covey planner with Harvard planner pages). Sorry – everything kind of blurred after, “…cleaned out stash room … Goodwill …”. And I’m sure that JJ doesn’t really need fancy, expensive presents. A 6-pack of Guiness says, “I love you, but not in a smarmy, mushy, get-thee-off-me-woman!” kind of way. Hell, spring for a couple of glasses on tap at your local if you’re feeling generous … I mean sentimental. 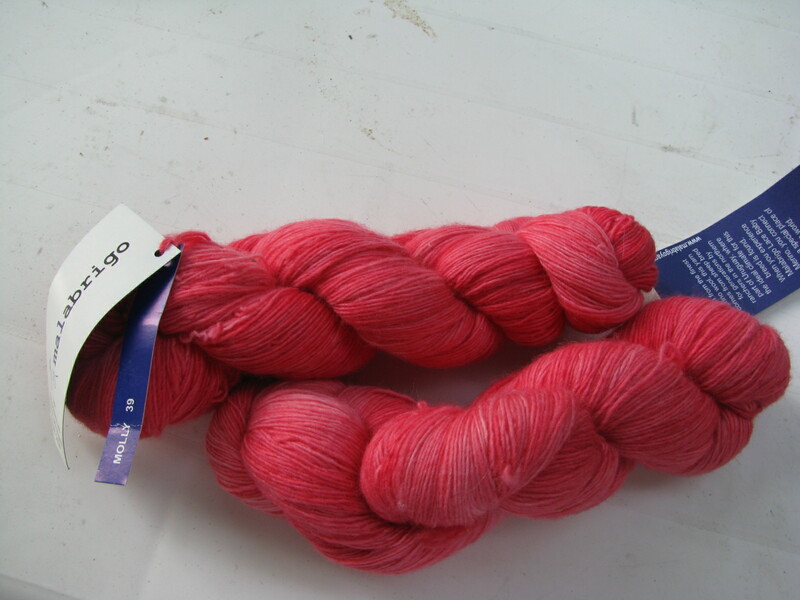 Lovely colour – I might have to try out this Malabrigo Lace of which I keep hearing.